50 Eggs Sommelier Daniel Toral and Swine Southern Table & Bar Chef de Cuisine Jacob Anaya are throwing a Swine and Wine Dinner on April 14 at 6:30pm. 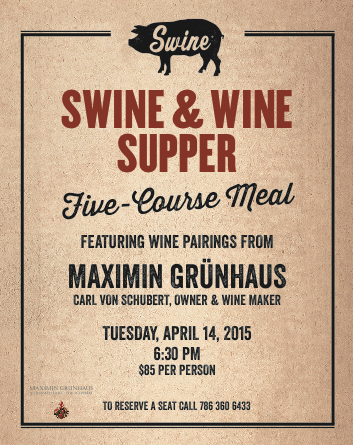 The dinner is featuring the Rieslings of Maximin Grunhaus, from the Mosel in Germany, along with special guest Carl Von Schubert, owner & winemaker. Tickets are $85 and include drink pairings (exclusive of tax and gratuity). Swine is located at 2415 Ponce de Leon Blvd in Coral Gables. Reservations can be made by calling 786.360.6433.